The European University of Rome (EUR) is a private, legally recognized university that releases academic qualifications with legal value. The EUR offers Bachelor’s Degrees in Economics and Business Management (L-18), Psychological Sciences and Techniques (L-24) and Tourism and Land Management (L -15); Master’s Degree in Economics and Innovation Management (LM-56) and Psychology (LM-51); Bachelor’s+Master’s single cycle Degree in Law (LMG-01) and Sciences of Primary Education (LM-85 bis). Furthermore, it offers PhD and advanced training and specialization courses. The European University of Rome, founded in 2004 by the religious congregation of the Legionaries of Christ, is part of the great tradition of the Catholic Church and an international network of universities. The years dedicated to higher education represent an exciting and decisive moment of life: the European University of Rome guides young people so that their university choice is carefully considered according to their attitudes and aspirations; in this way the talents of each student are personally valued, guaranteeing their access to a wide range of knowledge and, at the same time, reducing the risk of problematic paths. The project of the European University of Rome is located on a modernly organized campus and based on the centrality of the student. The courses offered by the European University of Rome are characterized by a participatory method that allows the student to establish a direct relationship with professors, according to the spirit of an authentic academic community. Theses courses are characterized by the high level of learning content and the efficient teaching organization. The curricular offer of the various degree courses includes activities of social responsibility and personal skill development in order to foster personal growth, autonomy and postivive confront and commitment to others. The multiple opportunities to complete the academic training with periods of study abroad allow the student to perfect his language skills, to broaden hia cultural horizon and to live important experiences for human and professional growth. The European University of Rome also accompanies graduates in accessing the world of work, offering internships and traineeships, along with preparation courses for interviews, qualifying exams for the exercise of professions and for state examinations. … At the service of a new global development of society. The European University of Rome prepares serious and capable professionals, trains people with a solid system of values, aware of their role in society, who will be in charge of building the common good and promoting the dignity of the person. Università Europea di Roma: We train people, we prepare professionals. Please note that all attachments listed below are available only in Italian. Statute of the European University of Rome, approved by Ministerial Decree May 4, 2005, published in the Ordinary Supplement of the Official Gazette no. 110 of May 13, 2005 – General Series and issued by the Rector’s Decree no. 14-ter of August 4, 2006. Ethic Code – University of Rome, issued by Rectoral Decree n. 139/16 of September 19, 2016. General Regulations of the European University of Rome, issued by the Rector’s Decree no. 12 of 31 July 2006. Didactic Regulation of the University D.M. 270/04 approved by D.M. May 4, 2005, published in the Ordinary Supplement of the Official Gazette no. 110 of May 13, 2005 – General Series – and modified by Rector’s Decree n. 14-bis of 4 August 2006, n. 29-07, n. 30-07 of 23 July 2007, n. 08-09 of 5 March 2009, n. 230-09 of November 3, 2009, D.R. 50/10 of 07/05/2010, with D.R. 96/11 of 20/09/2011 and D.R. 31/12 of 07/06/2012. Regulation of the Departmental Research Centre, European University of Rome, issued by Rector’s Decree no. 36/08 of 25 June 2008. Regulation of the Department of Human Sciences of the European University of Rome, issued by the Rector’s Decree no. 116/07 of September 4, 2007 and subsequently amended by D.R. n. 201/15 of 21 December 2015. Regulation for the administration, accounting and finance, European University of Rome, issued by the Rector’s Decree no. 262/08 of 10 October 2008. Regulation of Postgraduate Courses and Advanced recurring and permanent Training at the European University of Rome, issued by Rector’s Decree 121/07 of 4 September 2007, edited by D.R. 120/14 of 11.12.2014 and amended with D.R. n. 202/15 of 21 December 2015. Regulation on Honorary Fellowship of the European University of Rome, issued by Rector’s Decree 122/07 of 4 September 2007. Regulation of masters and advanced trainig courses, issued by D.R. n. N. 96/16 of 22/06/2016. Regulation of experts – issued by Rectoral Decree n.122 / 07 of 4 September 2007, modified by D.R. n. 9/17 of 9.02.2017 and subsequently amended by D.R. n. 157/17 of 15 December 2017. Code of conduct for students of the European University of Rome, issued by Rector’s Decree 124/07 of 4 September 2007. Regulation for internal mobility of full professors and assistant professors and university researchers at the European University of Rome, issued by the Rector’s Decree no. 03/08 of March 3, 2008. Regulation of Directors of the Council Regulation of the European University of Rome, which was approved at the meeting of CDA n. 03-09 of 7 May 2009. Regulation for the international mobility of students of the European University of Rome, approved at the meeting of CDA n. 02-09 of April 2, 2009. Regulation of the European University of Rome of the Students’ Representation, approved at the meeting of CDA n. 04-09 of June 4, 2009, as amended by D.R. 229/11 of 22/11/2011 and D.R. n. 150/13 of November 4, 2013. Regulation for the provision of teaching assignments in the contract pursuant to Law 30/12/2010 n. 240, issued by D.R. n. 27/11 of 25 May 2011. Regulation for the recruitment of temporary research, issued by D.R. n. 29/11 of 25/05/2011, pursuant to Law 30/12/2010 n. 240, edited by D.R. n. 135/11 of 29 September 2011 and subsequently amended by D.R. n. 67 of 21 July 2014. Regulation of the Doctoral Schools and doctoral courses, issued by D.R. 28/10 of April 16, 2010, as amended by D.R. n. 70/11 of 26 July 2011. Regulation for the University Fund for Scientific Research, issued by D.R.324 / 10 of 4 October 2010. General Regulation of the graduate schools and doctoral courses ex art.5, issued by D.R.328 / 10 of 4 October 2010, as amended by D.R. n. 71/11 of 26 July 2011 and with D.R. 25/12 of 17 May 2012. Implementation regulations for final exams, issued by D.R. n. 11/11 of 17 February 2011. Regulation for conducting graduation exams , issued by D.R. n. 203/15 of 21 December 2015 applicable to students who will enroll in the 2016-2017 academic year. Rules for the mandatory post – graduate psychology professional internship, issued by D.R. n. 247/11 of 13/12/2011. Regulation for the provision of Internet access service, issued by D.R. n. 248/11 of 13 December 2011. Regulation of the Department of Human Sciences, European University of Rome, issued by D.R. 34/12 of 25 June 2012. Regulation of the Department of Philosophy, European University of Rome, issued by D.R. 35/12 of 25 June 2012. Regulation of the Department of Geography, European University of Rome, issued by D.R. 36/12 of 25 June 2012. Regulation for the awarding of research grants, issued pursuant art. 22 of Law no. 240/10, with D.R. n. 17/13 of 12 March 2013. Regulation of the subjects of History and Philosophy of the European University of Rome, issued by D.R. # 32/13 dated 17 April 2013. Regulation for the allocation of part-time collaboration activities, issued pursuant the D.R. n. 09/13 of 24 January 2013 and subsequently amended by D.R. 3/14 of 29.01.2014. Rules for the establishment and accreditation of locations of doctoral studies, issued pursuant art. 19 of Law no. 240/10, with D.R. n. 18/13 of 12 March 2013 and subsequently amended by D.R. n. 55/13 of 28 May 2013. Regulation for the call of Full and Associate Professors, issued in application of Articles 18 and 24 of Law No. 240/2010 with D.R. n. 49/13 of 23 May 2013, amended by D.R. n. 84/13 of 26 July 2013 and subsequently amended by D.R. 47/14 of 08 July 2014. Regulation for the allocation of mention to the best student issued by D.R. # 118/14 of 05 November 2014. Regulation for the evaluation of teaching and scientific research of Full and Associate Professors in accordance with Law no. 240/2010 issued by D.R. 130/14 of 9 December 2014. Regulation for the establishment of spin-off at the European University of Rome, issued by D.R. n. 55/15 of 24/03/2015. Regulation of the Nucleus of University’s rating issued by D.R. No 94/15 of 26 June 2015. Please visit the following link to see all about the organisational structure of the UER (only available in Italian). To see all the solidarity initiatives of the UER, as well as information about our partners and sponsors, please visit the following link (only available in Italian). Please note that all contents regarding the calls listed below are in Italian. Call for organizer tutor and coordinating tutor (pursuant to Article 11, paragraph 2 of the Ministerial Decree of 10 September 2010 and of Article 1 of the Ministerial Decree of 8 November 2011) for the Master’s Degree in the single-cycle Sciences of Primary Education Programme. Below is the document containing the evaluation of teaching (expressed in average percentage scores for each course of study) based on the opinions of the students. The summary results refer to the A.Y. 2014-2015. Read the summary results of the students’ opinions about the 2014-2015 Degree Courses. The Quality Presidium of the European University of Rome is established by D.R. n. 54 of 05.28.2013 and subsequently integrated by D.R. 130 of 16/09/2013. an accreditation system for the university courses. the strengthening of the self-assessment system of the quality and effectiveness of teaching and research. The Quality Presidium is the University body established pursuant to Ministerial Decree 47/2013 and ANVUR, the Self-Assessment System document, Assessment and Accreditation of the Italian university system. This body plays a key role in ensuring the academic quality (AQ) as a guarantor in the articulated university system of the quality of curricula and teaching facilities, through the centrality of the student. Concerning teaching activities: it organizes and continuously verifies that the information contained in the SUA-CdS of each University’s degree program are updated; it oversees the smooth running of QA procedures in order to ensure that educational activities are carried out in accordance with what was planned and stated; it regulates and verifies the periodic activities of the Study Course Review; it evaluates the effectiveness of improvement interventions and their actual consequences, ensuring the proper flow of information to and from the Evaluation Team and the Teachers-Students Joint Commission. It continuously updates the information of the HIS-RD of each department (or other internal research organization joints) and oversees the smooth running of QA procedures for research activities in accordance with the programme and ensures the proper flow of information to and from the Evaluation Committee. Please visit the following link to read about the responsibles and legislation of the intern evaluation system of the Università Europea di Roma. The UERStat, the Statistical Office of the European University of Rome, deals with the detection, analysis and publication of data relating to university life. sending information about the European University of Rome to the media. For internal diffusion, the Office will carry out a detailed set of current statistics on the student population and the University staff. The works will be collected in a publication that will be issued usually twice a year, the Statistical Bulletin, and will be distributed by e-mail to accredited users. In terms of information online, the Office, which can be reached through the university website, will be actively involved in the development of a data warehouse service of the University by managing the production, processing and definiting the specific development of the service and its consultation. Over current activity, the Office is committed to provide customized products requested by institutional entities, both internal and external, to the University concerning various aspects of management and its processes. Associate Professor of Economic Statistics at the European University of Rome. Professor of Economic Statistics at the European University of Rome and Coordinator of the Master of Science in Economics and Business Administration. The United Nations Educational, Scientific and Cultural Organization – UNESCO – has signed an agreement with the European University of Rome and the Pontifical Athenaeum Regina Apostolorum, establishing a UNESCO Chair in Bioethics and Human Rights. The Chair belongs to the Institute of Bioethics and Human Rights, supported by the School of Bioethics of the Regina Apostolorum and the Faculty of Law at the European University of Rome. The chair promotes a broad exchange of ideas and experience-sharing through dialogue among higher education institutions from different countries, especially in the developing countries. Our direct partners (UNITWIN) are the Universidade Agostinho Neto (Luanda, Angola) and the Universidad Anàhuac (Mexico City, Mexico). The UNESCO Chair establishes a space for reflection, study and information on the application of the principles of bioethics in science, medicine and new technologies, in light of the Universal Declaration on Bioethics and Human Rights UNESCO. Through comprehensive training, research and information, the Chair aims to contribute to the recognition and promotion of a comprehensive and integral vision of bioethics, bringing to light the values and the universal principles and their legal implications with regard to human rights. Residenza UER welcomes the students of the Università Europea di Roma in a modern and lively living space, immediately adjacent to the University, designed to accommodate young university students in a place that is, above all, an opportunity for meeting, growth and training. Through the experience of community and sharing, training meetings and personal accompaniment, thanks to a team of trainers always available, Residenza UER is a privileged environment for the integrative training of the students who live there, in full continuity with the Università Europea di Roma’s project. 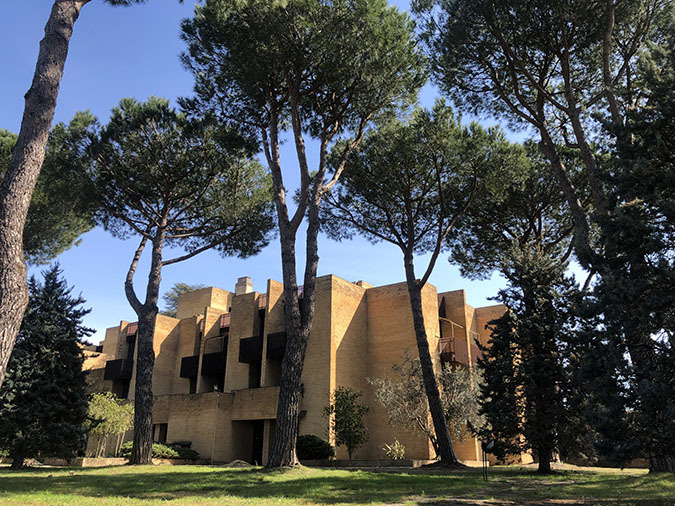 Residenza UER is part of the training project of the Università Europea di Roma, promoting the integrative training of all its students and accompanying them in the academic, human, social and spiritual sphere, not merely offering a place to stay for its guests. In line with the training project of the Università Europea di Roma. Personalized attention, individual meetings, a team of specialized trainers.